For years, screenwriters searched for new ways to put the protagonist or hero into jeopardy to drive the plot forward. It’s so common that many writers lost track of the one key element that makes it effective – Making sure the audience cares about the hero first. People will flock to see Will Smith’s latest action and adventure film, After Earth, because his films consistently bond the audience to the main character. This bonding technique helps the audience to care about the character to the point of being emotionally invested in his outcome — An overflow of a well developed character. Back to the Future, a Michael J. Fox vehicle, endeared the audience to the main character enough to drive a trilogy. In fact, it was the first Sci-Fi film I remember seeing that made the audience care deeply about the hero and raised the stakes to the point where the audience was emotionally invested in the story. Once this bond is set in place, the screenwriter can use the same seven ways to raise the stakes in their movie, which I discovered while studying Back to the Future: Instinct to Survive, Need for Safety/Security, Desire to Love and Belong, Lifting Self-Esteem, Desire to Quench Insatiable Curiosity, Need for Balance in Life, and Expression of Self-Realization. Life against death is the baseline for the survival scenario. While most films don’t push the extreme, many find a way to put the hero in a form of jeopardy that would dramatically change their life to a point where they might not survive. 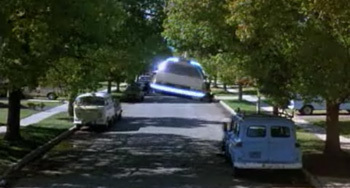 In Back to the Future, the mere sending of Marty back in time was sufficient. He found himself not relating to the things we take for granted. When Marty found himself in the diner needing to order a drink, he asked for a TAB. The server pointed out that he couldn’t have a tab (or bill) until he ordered something. 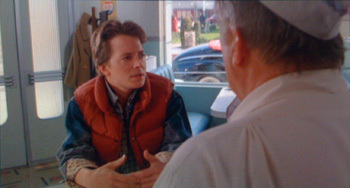 Marty then asked for a Pepsi Free, but was met with resistance when the server stated that if he were going to order something he’d have to pay for it. Reluctant to ask for anything else specific, Marty asked for something without sugar and received a cup of coffee. It didn’t take long for Marty to realize that he needed to be careful about his comments and what he shared with others in order to survive his stay in 1955. Most of those mistakes were based on common practices of the audience’s day in 1985, causing them to bond with him all the more. They understood how easy it would be to make the same errors. However, a stronger survival mechanism was put in place to drive the action plot. 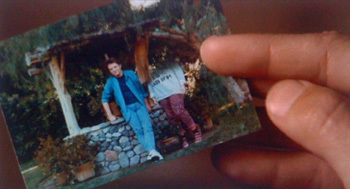 It was demonstrated with a picture of Marty’s family slowly being erased because his time travel caused his mom and dad to never meet or kiss for the first time, bringing an end to him and his sibling’s existence. Marty had to get his future mom and dad to meet and kiss the night of the dance or his very existence would disappear – A powerful point of jeopardy driving the film. Another universal point of jeopardy is associated with our longing to be loved and accepted. We will go to great lengths to secure our love for another and we’ll fight anything that tears us away from belonging to something important or someone special. This can be in the form of a sense of community, team spirit, romantic interests, or traditional family. The key is to paint a picture that others can also hope for or have sampled at some point in their life. 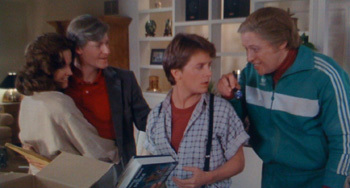 Marty experienced this sense of family while bringing together his mom and dad, working on time travel with Doc Brown and his love interest with Jennifer. Most individuals want to be looked up to by somebody. They want to be recognized and respected among their peers. There is an ingrown desire for us to be recognized for our skills, talents and contributions in life. We want to be somebody. A healthy form of self-respect or self-esteem would allow George to win the love of Lorraine regardless of what Biff might attempt. This innate drive is significantly different than our need to belong or be loved. It is the inertia that causes us to take action for something we desire or believe in. Putting the very essence of this gut felt understanding of whom we are in jeopardy, drives the hero into action in order to protect himself or the one he loves. 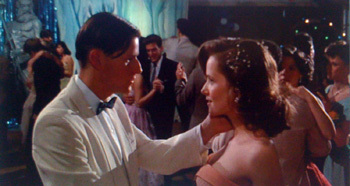 In Back to the Future, Marty had to work diligently with George to raise his self-esteem in order for him to ask Lorraine to the dance, saving his life from being erased from existence. He had no choice but to work with George, even though he seemed beyond help. No matter how often we try to stuff it or coax it, some form of curiosity always drives us. We have an unending need to know and understand who we are and how we fit together with others. Deep within us is a natural instinct to figure out how things work and to comprehend how things piece together in our lives. We need to make sure all the pieces of our life fit harmoniously together in who we are. 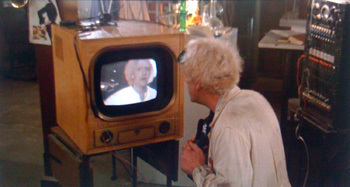 Doc Brown found watching himself on television enticing. It drove a secondary plotline that allowed him to save his own life in 1985 after reading a letter written by Marty in 1955. His curiosity drove him to risk messing up the timeline continuum and ended up altering history. This form of jeopardy brought a surprise finish to the film and set up several comedic situations. Balance is found in the people who are secure, confident, and experience love. They hold a sense of balance in their lives and are connected to someone greater than himself such as a mentor, wise counselor or God. When this line of connection is broken, the main character feels a dramatic sense of foolish unbalance in his life, ripe for shifting the plotline at a moments notice. 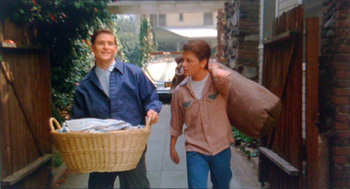 In act 1 of Back to the Future, we find that Marty is a kid who seems to be misplaced in the wrong home. This cool kid is living among a negative family who seems to be from another planet. The family is out of balance or dysfunctional at best. It sets up many plot points for exploration, as Marty struggles to find harmony within his life. By the end of the film and after a few history-changing events, Marty finds himself in a home with a cool, affirming and positive family. Everyone wants to know ourselves and be who we are. This inner spirit plays out through self-expression and the actualization of our talents and abilities. We find our lives filled with moments where we can hone our skills to match who it is we see our self to be. A comedian has to be funny and entertaining. A doctor has to be logical and methodical. A musician or actor needs to excel at their craft and please their audience. In act 1 we learn that deep within Marty’s soul is a musician waiting to come out. When this form of self-expression is put in jeopardy, the story takes some interesting turns. 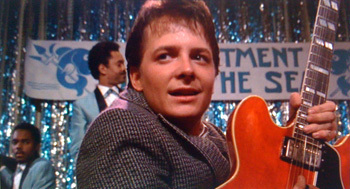 Marty finds himself delaying his return to 1985 so he can play one more song in 1955. He had to do it because of who he was. This escalates the risk factor of him being able to get home and drives the film to its climax. Any of the above areas will raise the stakes of the show, but it will only grip the audience if they can relate or bond with the character in those moments. Hooking the audience with a more universal stake, gives a greater opportunity for driving the plot forward. This can also be accomplished by keeping the character’s goal just barely out of his reach, causing the audience to strain on his behalf in hopes of subconsciously helping him achieve it. The more the audience experiences the main character’s goal, the more they will connect with him and the easier it will be to drive the plot forward with interesting twists. Playing with the related emotions of the character then allows you to play with the audience’s emotions as well. Both will find themselves on the same journey. Pulling on these emotional strings will then heighten the jeopardy or raise the stakes for the audience, making the pay-off at the end of the climax of greater value.